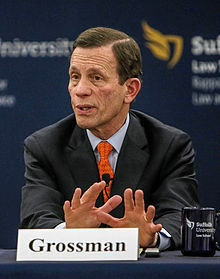 Steven Grossman (born February 17, 1946) is a former Treasurer and Receiver-General of Massachusetts and candidate for Governor of Massachusetts. Grossman previously served as chairman of the Massachusetts Democratic Party from 1991 to 1992, president of the American Israel Public Affairs Committee (AIPAC) from 1992 to 1996 and chairman of the Democratic National Committee from 1997 to 1999. In the spring of 2015, Grossman became the CEO of the Initiative for a Competitive Inner City, a Boston-based nonprofit focused on strengthening inner city economies that was founded by Harvard Business School professor Michael Porter. Prior to his involvement in politics, Grossman worked at Goldman Sachs. In 1975 he left Goldman Sachs to work in his family business, a paper supplier called Massachusetts Envelope Company, now the Grossman Marketing Group. In 2012 Grossman was named number 47 on a list of the 100 most influential institutional investors worldwide by the Asset International magazine. Grossman received his bachelor's degree in Romance languages from Princeton University in 1967, and his Master of Business Administration degree from Harvard Business School in 1969, where he was a Baker Scholar. He served in the Army Reserve during the 1970s, and his South Boston unit numbered among its members Thomas P. O'Neill III, Ed Markey, and Markey's brothers Richard and John. From 1991 to 1992, he was chairman of the Massachusetts Democratic Party, also serving as chairman of the American Israel Public Affairs Committee from 1992 to 1996. From 1997 to 1999, he was the chairman of the Democratic National Committee. He ran unsuccessfully for Governor of Massachusetts in 2002, losing the Democratic nomination to Shannon O'Brien with 0.80% of the vote in the Democratic Primary. He had announced his withdrawal from the race over the summer, but too late to remove his name from the ballot. He was elected to succeed Tim Cahill as state treasurer in November 2010, defeating Republican State Representative Karyn Polito. On July 13, 2013, Grossman declared his candidacy for Massachusetts Governor. On April 17, 2014, Grossman faced off against Gun Owners' Action League of Massachusetts Executive Director Jim Wallace in a debate over tougher gun control laws. On June 14, 2014, Grossman won the endorsement of the Massachusetts Democratic Party at the Democratic State Convention in Worcester, Massachusetts, where he received the most support by a wide margin. Grossman received strong support from the LGBT community during his campaign, including the endorsement of all five LGBT state legislators: State Senator and Majority Leader Stan Rosenberg, Representative Denise Andrews, Representative Elizabeth Malia, Representative Kate Hogan, and Representative Sarah Peake. Grossman's broad base of support included endorsements by unions such as the United Union of Roofers, Waterproofers and Allied Workers Local 33 and Teamsters Local 122 as well as advocacy organizations such as Mass Retirees and the Coalition for Social Justice. During the campaign Grossman also received support from the Mass Forward Super PAC, which became the first Super PAC subject to a new state campaign finance disclosure law that requires the top five donors names be included on advertising materials. In the disclosure, Grossman's mother, Shirley Grossman's name appeared as one of those donors. On September 9, 2014, Grossman ended his gubernatorial campaign after losing the Democratic primary to Martha Coakley. He is married to Barbara Wallace Grossman a professor of theater at Tufts University, and they have three children. ^ "Grossman defeats Polito in Mass. treasurer race". Boston Globe. November 2, 2010. Retrieved November 3, 2010. ^ Gitell, Seth (16 March 2000). "Talking Politics". The Boston Phoenix. Archived from the original on 3 April 2013. Retrieved 12 December 2013. ^ Grossman Marketing. "History". Grossman Marketing Group. Retrieved 12 December 2013. ^ "The Power 100". aiCIO Magazine. Asset International Inc. Retrieved 19 July 2013. ^ "MA Governor - D Primary 2002". Our campaigns. Retrieved 12 December 2013. ^ "Democrat Steven Grossman elected treasurer of Massachusetts". MassLive.com. Retrieved 13 July 2013. ^ O’Sullivan, Jim (13 July 2013). "Treasurer Steven Grossman announces bid for governor, as state Democrats gather in Lowell for annual convention". Boston Globe. Retrieved 13 July 2013. ^ "Grossman Targets Coakley In Debate With Head Of Mass. Gun Lobby". boston.cbslocal.com. Retrieved 3 July 2014. ^ "Steve Grossman gets Democrats' nod at convention". bostonglobe.com. Retrieved 3 July 2014. ^ "Massachusetts Sen. Stan Rosenberg leads LGBT legislators in endorsing Democrat Steve Grossman for governor". masslive.com. Retrieved 3 July 2014. ^ "ROOFERS & WATERPROOFERS LOCAL 33 AND TEAMSTERS LOCAL 122 ENDORSE GROSSMAN FOR GOVERNOR". Archived from the original on 7 July 2014. Retrieved 3 July 2014. ^ "MASS RETIREES ENDORSE GROSSMAN FOR GOVERNOR". Archived from the original on 7 July 2014. Retrieved 3 July 2014. ^ "Grossman Endorsed by MA Coalition for Social Justice". Retrieved 3 July 2014. ^ Johnson, Akilah. "New law identifies Super PAC donors". www.bostonglobe.com. The Boston Globe. Retrieved 5 August 2014. ^ "Boston Globe". Boston Globe. Retrieved 10 September 2014. This page was last edited on 11 April 2019, at 21:31 (UTC).